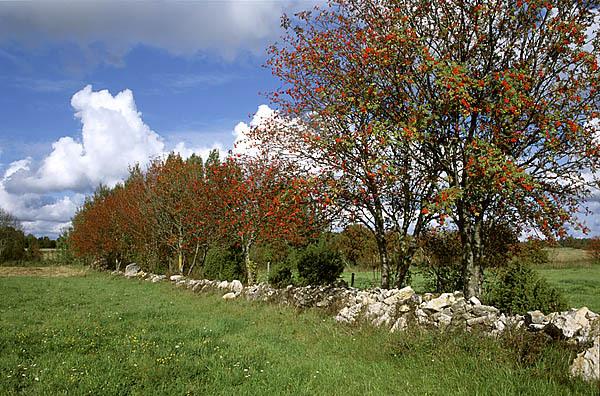 Besides the common rowan a rare and protected species from the same genus grows on Saaremaa, the rock whitebeam, Sorbus rupicola, that has reddish or yellow-orange, oval berries. Another relative, the Swedish whitebeam, Sorbus intermedia, is familiar from city parks, and has round orange red berries that are a little larger and milder in taste. Scientists call the "berries“ of these trees pomes. All have differently shaped leaves but belong to the same genus, Sorbus. Everyone knows the pinnate leaves of the common rowan; the leaves of the whitebeam remind a little of oak leaves, but with a greyish underside, and the underside of the oval leaves of the rock whitebeam is also greyish. The berries are a valuable addition in the diet of birds in autumn and it is easy to observe their doings in the rather low-growing trees. The berry guzzlers spread the rowans: the seeds pass their organs undigested and are dropped together with "fertilizer“ into nature’s cycle.